Clean Up Those Hard Drives! 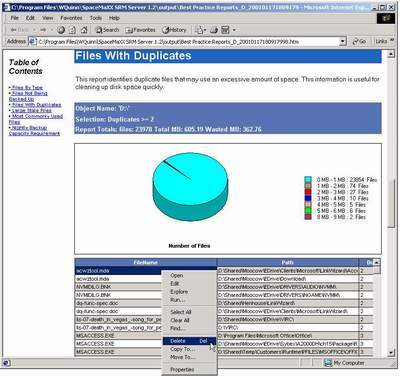 WQuinn’s SpaceMaXX SRM 1.2 offers automated analysis of overloaded network storage. Work, goes the old maxim, expands to fill the time available. Translated to the network administrator’s world, that means files expand to fill the storage space available. That 45GB hard drive that looked so spacious when installed a while back now seems cramped, with MP3 and duplicate files stuffed everywhere. Worse, how do you know what to delete and what to back up? And, how large a backup tape drive do you need? Well, instead of spending hours manually scanning your drive, you can turn to SpaceMaXX SRM, which offers automated tools for managing hard drive space. The product comes in both server (Windows 2000 and Windows NT) and workstation (Win2K Professional, Windows Me and Windows 9x) versions. For this review, I checked out the server version on my Win2K network. Installing SpaceMaXX SRM is simple, with no reboot required. Then, in two clicks, you can go from the SpaceMaXX Monitor taskbar icon to a Best Practices report in HTML. This report quickly shows you what file types are taking up the most space, where duplicate files are, and what files can be deleted (for example, files last accessed more than 60 days ago). Every item has a right-click menu so you can perform your cleanup directly from the report. Besides generating reports on the fly with SpaceMaXX SRM, you can schedule them for periodic compilation or when disk usage crosses a threshold. The server version lets you report on multiple remote hard drives from a single console, a handy feature if you’re responsible for storage across a network. You can customize reports as well. For instance, you might want to change the “trigger” on the stale files report from 60 to 90 days. You can even define your own reports using a simple visual query tool. SpaceMaXX SRM performed flawlessly on my network. Report generation is a bit time-consuming as every report requires a disk scan — the product doesn’t appear to cache information between reports. This makes sense as it keeps things up to date, but it can make running several ad hoc reports in quick succession slower than one might like. The convenience of being able to perform cleanup actions directly from the report interface is hard to appreciate until you use it; then it becomes one of those features you can’t live without. I can think of features I’d like to see added to SpaceMaXX SRM, such as MMC integration, so I can host it in the same window with the rest of my server-management tools. But even taking this into account, SpaceMaXX SRM is a strong release that’ll be useful to anyone fighting the disk space battle.